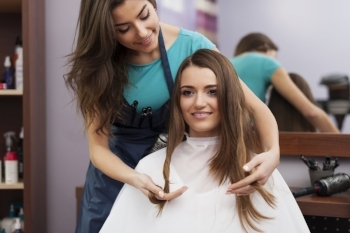 When working in a salon, your biggest challenge is creating a lifelong customer. Even if your guest leaves with a haircut they love, they’re unlikely to schedule another appointment if they didn’t enjoy their time in your salon. It’s no longer about simply satisfying your clients’ needs, in order to keep them coming back you must find new and innovative ways to really “wow” your guests and add value to their experience. From large-scale, salon-wide changes to smaller, more personal adjustments, industry expert, Kellie Johnson offers her best advice for adding value to the salon experience. We introduced you to Kellie in our Beyond The Technique Podcast, but if you missed her previous interviews we’ll give you a quick recap: Kellie is the owner of the renown Elan Studio and a council member of The EmpowHERment Project. Aside from her career in the beauty industry, Kellie is also a certified Hypnotherapist and Professional Coach. With expert industry insight, she offers a few tips and tricks on going the extra mile and really wowing your clients. If you really want to impress your clients, you need to engage them as soon as they step foot in your salon. The general rule of thumb is that a client should be greeted within eight seconds of their arrival. Because this is such a short window, you must find the best way to welcome clients in without missing a beat. Kellie emphasizes the significance of greeting clients at eye level. Whether that involves eliminating chairs from behind the receptionist desk or specifically staffing greeters to maintain a post at the entrance, this small signal speaks volumes for your guests. Kellie also highlights the importance of presentation, and suggests that all staff be required to wear nametags and maintain a consistent dress code. You could incorporate all-black uniforms for a high-end feel, or playful work aprons for a vintage vibe. Whatever you decide, remember that the uniforms should match the feel of the salon and nametags should always be visible to your guests to add that personable touch. Adding an optional, complimentary service, such as a scalp massage, to your salon routine automatically elevates your clients’ experience and reduces waiting time, leaving no guests unattended. This can be as simple as having an apprentice prep the client for a few minutes while their stylist is getting ready – a small gesture goes a long way! The key here is making this bonus treatment optional. Although many clients are likely to oblige, others will opt out, which shifts the responsibility onto them for any waiting they choose to do before they’re escorted to their station. You can even go the extra mile by giving clients the option to tailor their scalp massage to their needs. If your client is feeling stressed at work, go with a lavender scent. If they’re in need of a pick-me-up you might work in a bit of jasmine oil during the massage. This personalized experience is one way to make your clients feel important and appreciated before they even sit down in the chair. When looking for ways to add value to your clients’ experience, it’s easy to forget that this can be done at any stage of their visit, even the shampoo. Kellie suggests using heated towels as a small way to show your clients you care. Drying your client with a warm towel after treating them to a scalp massage and finishing their shampoo is the icing on the cake. It’s an unexpected surprise, but it’s these kinds of little things that clients reference in their reviews. Quick Tip: Customer reviews can be a great place to hunt for new ways to add value. When surfing through your online reviews, pay attention to those seemingly insignificant details that are repeatedly popping up and you might just stumble upon a new way to elevate your salon experience. Personalization goes a long way in enriching your clients’ salon experience. To give your salon that personal touch, Kellie suggests adding name plates to each station that stylists can use to welcome their guests. Kellie stresses the importance of having the whole team on board when introducing major changes like these in the stylists’ routine. With the name plates for example, your entire staff needs to be prepared to put in the extra effort to spell the client’s name correctly and have it written by the time they’re due to arrive at the salon. If you can get your team to buy in to these new techniques, you’ve already won half the battle. Really wowing your clients is often more about the intangible aspects of your business. Returning customers come back for the whole experience — the quality service, the friendly faces and the positive vibes. As a salon owner, this means creating a great environment to work in and as a stylist, this means showing up for your clients every day and coming to work with good energy and enthusiasm. When Kellie senses low energy in her salon, she playfully suggests that her staff do five jumping jacks just to get the blood flowing again. It’s all about the energy. You have to keep it flowing, and keep it positive—but it really needs to come from the leaders, they’re the guardians of the company culture. Life is a lot easier when you make it about others. Most of you got into this business because you enjoy making other people look and feel good, on the inside and out. If you make each day about your clients, they will greet you with the same energy and enthusiasm — it all comes full circle. To learn more about Kellie Johnson, listen to her first podcast, episode 123. To listen to the podcast that inspired this blog, check out episode 127.